Apple has released a newly refreshed Macbook Pros. Now this is normally news worthy of other sites. But what makes this new refresh news to us in pos-production… is the introduction of the new Intel designed Thunderbolt. This new connections creates the fastest I/O ever in a laptop. The connection speed is even faster than the recently introduced USB 3.0. I have been very impressed by USB 3.0 speeds as I discussed in my Asus Laptop review. 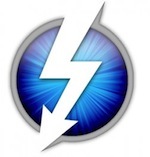 Thunderbolt claims blistering speeds up to 10Gbps in both directions. This means you will now be able to get to editing your footage much faster than ever before. Transferring large uncompressed footage such as RED 4K can be done much faster, saving time and money. Apple will most likely refresh the MacPro towers to include Thunderbolt as well. The next question is what devices will support this? Well we have already heard from some of the biggest names in post-production third part support. I.e. AJA, Apogee, Avid, BlackMagic, LaCie, Promise Technology, Universal Audio, and Western Digital. Now weather or not thunderbolt will be widely accepted as USB remains to been seen. However for those of us with FW800 ports wanting something faster, it seems your voices have been heard. 2011 is looking like a big year for pos-production and production. On the horizon we have Final Cut Pro 8, Apple Lion (64bit), and new faster MacPro towers. The time to start saving up is now. Waiting to see some TB hard drives come out! I am sure we will see them soon, with LaCie, Western Digital on board…no doubt they have new products to release. Maybe we will see them at NAB. Thanks for your time for this article. Thanks for information. Good News. Thunderbolt to the rescue! It seems to work blazing fast with Final Cut Pro!! !